Load an E-cell rule file (with extension .txt .er or .eri) using the menu File->Open. Errors might be displayed on the console. You will then see a window like the one below. Click on a substance to see all reactions it is involved it. Click on a reaction to see all substances it involves. 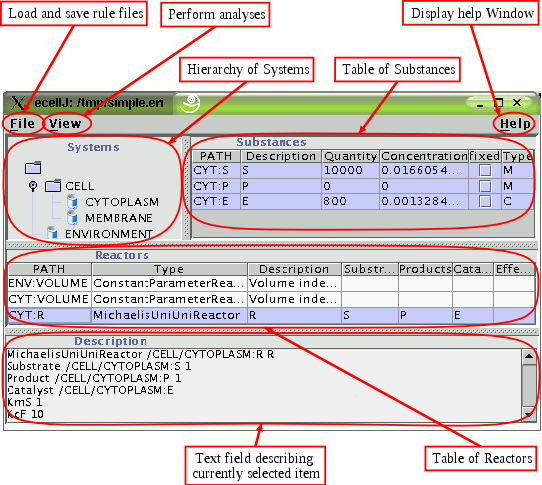 Click on a system to see all reactions and substances contained in the system. Currently, only substances can be edited directly in ecellJ. Changes made here are reflected in the output file when saving (with File->Save). Results of the analysis steps (in the menu View) are displayed in the description area. The results are also automatically copied to the clipboard to be pasted into another application.